It's okay to refuse to compromise! The Wolfgang Concours-Series Microfiber Towel is a carefully-crafted, edgeless microfiber buffing towel that indulges your paint with its silky-soft plushness. By combining it's thick density with a special, medium-length fiber strand, the Wolfgang Concours-Series Microfiber Towel has quickly become the go-to towel for almost any exterior car care task: removing waxes, sealants, detail sprays and spray protectants. 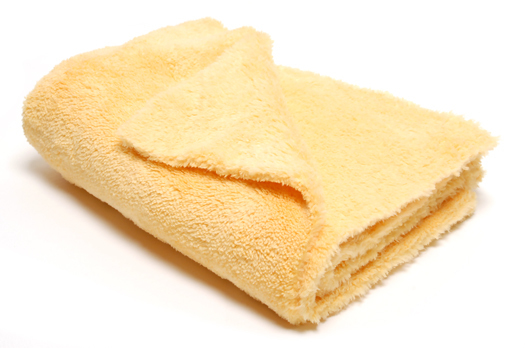 This towel is so durable you can even use it for waterless and rinseless washing. It's soft on your skin and softer on your paint. Rubbing your paint with the incorrect towel is fastest way to dull the shine and inflict scratches. The Wolfgang Concours-Series Microfiber Towel babies your paint as it glides over the surface. When used with detail sprays, dust and dirt are trapped in the thick, 460 g/m^2 microfiber. The edgeless design virtually eliminates any chance of scratching. Microfiber towels have been used for the better part of two decades to protect car finishes as they are wiped, just as car waxes have been used for the better part of a century to protect the paint. Much like car waxes, which have evolved and improved with over time, the Wolfgang Concours-Series Microfiber Towel represents a new era in microfiber technology. Never has a microfiber towel been so versatile, yet so soft for your paint. The secret is the silky-soft microfiber strands which glide across the paint without dragging. Each strand of the Wolfgang Concours-Series Microfiber Towel features thousands of unbelievably fine fibers that clean safely without scratching. You can use the Wolfgang Concours-Series Microfiber Towel for any exterior cleaning task, from removing stubborn polish residue to wiping dust off with a quick detail spray. The plush fibers make it easy to apply a spray wax or sealant without streaking. Wolfgang Concours-Series Car Care Products are used by enthusiasts who appreciate the latest advancements in car-care technology. The Wolfgang Concours-Series Microfiber Towel is the first towel to receive the prestigious Wolfgang name. Take your paint care to the next level, with the soft and silky smooth Wolfgang Concours-Series Microfiber Towel. Hands down one of the softest towels on the market today. Specializing in removal of waxes and sealants along with detail spray wipedowns and final wipedowns. Edgeless design always safe to use. Many different manufacturers offer these kind of towels so it can be had for much cheaper if one were to look around.